How Could The US-China Trade War Impact Crude Oil Prices? How Will BP’s Shareholders Benefit From The New Tax Bill? BP Plc. (NYSE:BP), the European integrated energy company, reported an impressive set of financial results for the December quarter and full year 2017 on 6th February 2018((BP To Announce December Quarter 2017 Results, www.bp.com)), beating the market estimate for both revenue as well as earnings by a huge margin. This earnings beat was largely driven by the jump in its upstream production, and price realizations, coupled with improved refining margins for its downstream operations. Given the strong operational performance, the company’s cash flows from operations improved significantly during the year, which allowed the company to reinstate its share repurchase program. Additionally, the oil major successfully commissioned seven major project start-ups planned for the year, within schedule and under budget, which further speaks of its excellent execution skills. 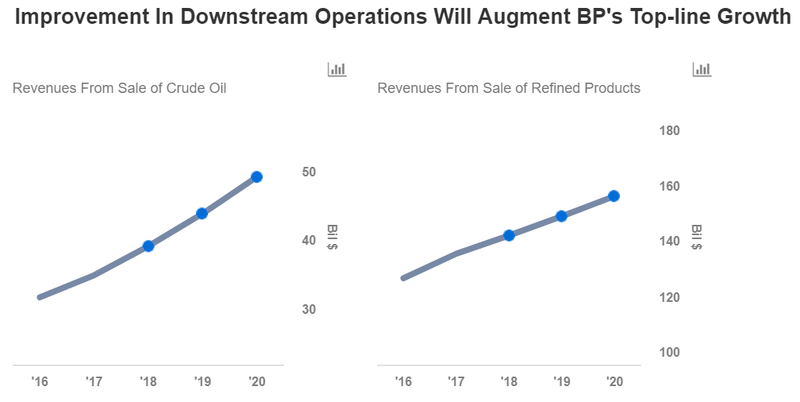 Hence, we believe that BP is on track to deliver on its upstream expansion plans and enhancing its downstream operations to enhance its shareholder value. 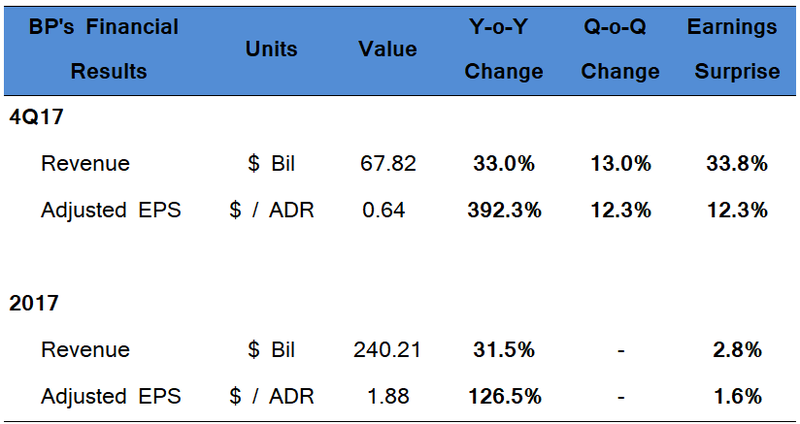 We have a price estimate of $41 per share for BP’s stock, which is in line with the current market price. We will update our model shortly to reflect BP’s 2017 results and guidance for 2018 and beyond. As promised at the beginning of 2017, BP delivered seven major project start-ups in its upstream operations during the year. On an average, all the projects were delivered on schedule and under budget, emphasizing the company’s strong and disciplined execution. These projects, along with the ramp-up of the six start-ups in 2016, contributed to a 10% year-on-year increase in its upstream production. Going forward, these projects are expected to contribute an additional production capacity of 800 thousand barrels of oil per day to BP’s existing capacity by 2020. The year 2017 was one of the best years for BP’s downstream operations, as the division generated around $1 billion improvement in its underlying earnings during the year. The division benefited from continued volume growth in premium fuels and lubricants, and improved performance of its refining operations. Going forward, BP plans to continue growing its retail network across existing markets as well as new markets such as India, Indonesia, Mexico, and China. Backed by the strong operational performance, BP’s cash flows from operations surged to $24.3 billion (excluding pre-tax oil spill related payments) during the year. Further, the company received proceeds of $4.3 billion from its divestment program. These cash flows enabled the company to meet its capital expenditure, dividend payments, and oil spill obligations for the year. The company’s growing organic cash flows provided it with the confidence to recommence its share repurchase program with effect from the fourth quarter of 2017. This indicates the company’s optimism about the recovery of commodity markets in 2018 and its willingness to enhance its shareholders’ returns. You can create your own forecast for BP and visualize its impact on its price using our interactive platform.